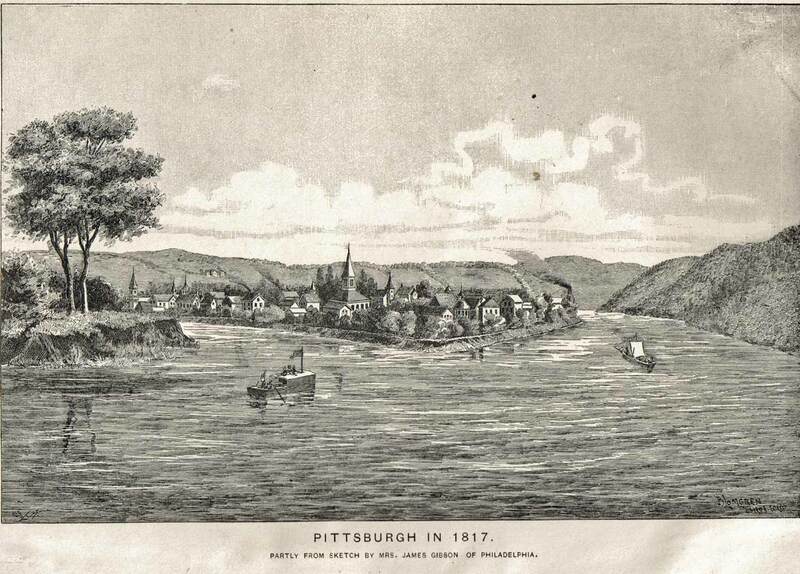 What attracted Richard Pearce and Charles Austen to Pittsburgh, Pennsylvania, in 1820? If they wanted to settle in America, they could have come to Boston as so many of the Percy descendants had, as mentioned in an earlier article. Many of my wife’s ancestors, all Germans, entered America through Baltimore. We know that Pearces had been in Maryland and Virginia since the 17th Century St. Mary’s settlement on the Potomac. Richard and Charles could have stayed in the prosperous New York area upon landing as hundreds of thousands of immigrants did, or crossed the Hudson to farm the rich soil of New Jersey, as a few other Pearces did. But, according to the Original Family Narrative, they immediately boarded a stage and headed south along what is now the New Jersey Turnpike for Philadelphia. Then again, apparently not contented with William Penn’s City of Brotherly Love, they boarded a stage west over the Allegheny Mountains, along what is now US Rt. 30, for the Gateway to the West, Pittsburgh. By then, most of Pennsylvania was covered by a general peace treaty with the natives of the Six Nations (1763). Many immigrants continued beyond Pittsburgh via the Ohio River to the settlements of Cincinnati and St. Louis, but to venture off on either side of the waterway was to enter “Indian Territory.” As it was, some of the renegade redmen occasionally led war parties back into Pennsylvania burning cabins and harassing settlers. The bottom line is that this land around Fort Pitt, which was wrestled away from the French and Indians with the burning of Fort Duquesne in 1758, was considered the American frontier, and it wasn’t the safest place to be. Earlier articles have speculated that Charles’ father, Ambrose, led the way by purchasing land in Jeromeville, Ohio several years earlier from a Frenchman known to have traded with the Indians. He had crossed the Ohio River and took what is now US Rt. 30 to fertile farmland just west of Wooster, a place with hamlets named for their founders such as Mohicanville or some dubious distinction such as Widowville. But, according to the Orignal Family Narrative, Richard and Charles, while on the stage to Pittsburgh, “became acquainted to a Mr. Robt. Davis, who had a brother-in-law by the name of Wm. Cochran.” Cochran had charge of government land along Pine Creek, about 12 miles north of Pittsburgh. A transaction took place that gave each of the young men 50 acres at 50 cents per acre. An earlier article entitled “The Ambrose Austen, Sr. Family” doubts the simplicity of this deal and cites the research of cousin Caroline Pinkers, but I suggest that the initial “stagecoach scenario” may have been an informal gentlemen’s agreement that was consummated formally at a later date. Nevertheless, the question on the table today is, “Why did the Pearces and the Austens settle near Pittsburgh?” Our discussion will center around several exciting archival and Internet documents. We’ll consult the recently discovered Pine Township Bicentennial Booklet and quote at least one historian and one philosopher. My objective is to provide a rich, new perspective on our forefamilies of Western Pennsylvania. The first immigrants to America were of necessity a combination of hunter/gatherers and farmers/ranchers [for an interesting new theory of why Western Europeans so successfully colonized the world, see Jared Diamond’s award-winning Guns, Germs, and Steel]. Our Original Family Narrative claims that Richard Pearce was “a miller by trade,” which, if Chaucer is any measure [see article entitled “The Miller’s Tale”], was a profitable middle-class trade. If recent research can’t confirm Charles Austen’s military credentials, it at least reveals his traditional family status as a “gentleman.” So, both men were no doubt “above” the vocational activities of common laborers, but perhaps depressed economic conditions in England after the close of the Napoleanic Wars was a threat. Certainly, the end of the British-American War of 1812 allowed the United States to begin a definite program of economic and geographic expansion. Originally, white settlers claimed land in Western Pennsylvania by simply “notching” a tree near a spring [see earlier article involving “Tomahawk Rights”]. The defense of that land was up to the family. The land north of Pittsburgh later was “legally” obtained for a few hundred dollars through a specific treaty with the Iroquois at Ft. Stanwix, New York in 1784. Ben Franklin had come up with an idea to pay Pennsylvania’s Revolutionary War soldiers with this and other land around the state. A Philadelphia auction offered blocks of 200-400 acres [The OFN reference to Cochran’s “400 acre government lot” was actually Patent #37 purchased in 1809 called “Delight”] for the much-depreciated Continental Army script, thus Pine Creek was sometime referred to as “Depreciation Land.” The Settlers’ Act of 1792 allowed families to secure unclaimed land by “improvement and settlement,” that is they had to develop 2 of every 100 acres they selected, and after two years they could obtain a patent or deed for a small fee from the State Land Office in Pittsburgh. Communication between offices in Pittsburgh and Philadelphia, the State Capital then, was not good to say the least, and some parcels had multiple owners. Law suits, legislation, and many years of negotiations finally settled such disputes. [Pittsburgh] was centered in the Western Pennsylvania coal fields. It’s cheaper to bring iron to coal for smelting than to bring coal to iron, so Pittsburgh became our major iron producer soon after the first Western Pennsylvania blast furnace was set up in 1790. It became our major glass producer, too, because glass making also requires a lot of heat [and sand and later, when the world’s first natural gas was discovered nearby, she could make it even more efficiently]. The odd thing is that Pittsburgh was so inaccessible! It sits at the confluence of the Allegheny and Monongahela Rivers, which connect it to the ocean at New Orleans, over a thousand miles away. It took over two weeks for a loaded wagon to make the 300-mile road trip over the mountains from Philadelphia. Yet, in a few years Pittsburgh had acquired three newspapers, nine churches, three theaters, a piano maker, five glass factories, three textile mills, a steam engine factory, 4000 tons of iron processing per year, two rolling mills, most of our nail production, and – no surprise – a notorious air pollution problem. More about the later in a minute. In the decade before Richard and Charles arrived, Pittsburgh’s population had grown from 4,700 to over 7,000. The area could easily offer the human talent and skills to match the abundant natural resources. Futhermore, Pittsburgh had the first higher education west of the Alleghenies. A project of the early Presbyterians begun in 1787 called “The Academy,” it’s now the University of Pittsburgh. The Pine Township bicentennial book says, “There were two choices of travel in [the 1820s to Pittsburgh] – Conestoga wagon, which took three weeks and cost $5 per 100-weight; or stagecoach, which was much costlier but took approximately one week and consisted of four benches arranged crosswise with each seat accommodating three passengers. The journey [from Philadelphia to Pittsburgh] usually began around 3 a.m. Four horses pulled the coach” (29). The horses were exchanged for “fresh” ones at each tavern stop. We learn that the cause of the late difference between George IV and his ministry arose from a wish strongly expressed on the part of the king to bring his queen to trial, which would have terminated in her conviction and consequent beheading on the scaffold! The moment the ministry understood this they sent in their resignations. The king, finding his cabinet and the nation opposed to so sanguine a procedure, abandoned it. It was said, however, that he had positively declared he would not suffer her to be crowned with him. She was expected in England, and the opposition were making preparation to give her a splendid reception. Part II of Penhey’s “Commentary on ‘The Original Austen-Pearce Family Narrative’” [an early article edited and annotated by me] covers George IV’s marriage to his cousin Caroline, who ran off to Italy with their daughter, then tried to return to England to claim her queenship. WWW.BRITANNICA.COM confirms this crazy story reported in the Pittsburgh paper. These European working conditions were soon to be found in America. Mid to late 19th Century American immigrants from Ireland, Italy, and Eastern Europe became the “grunts” for the United States’ industrial revolution. 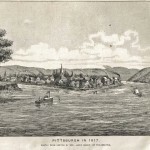 Pittsburgh was the perfect location for mining, milling, timbering, and subsequent transportation, and the Pearces and Austens arrived just in time to act as middlemen between the farmers and industrial workers in Western Pennsylvania. The Family Narrative reminds us that “Both Richard and Charles had never done much labour work in England,” but Richard “commenced at once to repair the mill, mill dam, and mill-race course,” and Charles “built a log house or took out timber for a house.” Richard was perhaps in a better position with his established business and regular income, but the narrative says the Charles “found it very hard work to farm and was much discouraged and was on the point of going back to England several times.” The inference is that at least they had the freedom and resources to return to Europe, whereas later, poorer immigrants didn’t. Many of them came over to escape political repression and worked under indentured servitude. Today, Downtown Pittsburgh is clean and clear. Her Golden Triangle began a sparkling transformation with the gradual demise of the American steel industry after World War II. A sampling of the world’s high-tech industries have set up shop where the rusty mills once stood. PPG Place, a proud symbol of the region’s prosperous glass industry, now has an ice skating venue to rival New York’s Rockefeller Center. With 40 miles of riverfront, the Greater Pittsburgh Area is home to dozens of national companies and more than 150 industrial research companies. Pittsburgh has become a leader in education and medicine. She offers entertainment at such sites as PNC Park, Heinz Field, Buhl Science Center, Phipps Conservatory, Carnegie Library and Museum, and dozens of stages and music halls. With its low cost of living and crime rate Pittsburgh was named “America’s Most Livable City” several years ago by Places Rated Almanac. But, if Pittsburgh took decades to change, the Pine Creek area of her northern suburbs seemed to change overnight. In our “Settlement” series we suggested that the Eminent Domain action by the County in 1927 was an attempt to preserve the original condition of the land and conserve its use for all the people of the Pittsburgh area. While the ancient wooden Pearce Mill and neighboring barn and out buildings were torn down, the family home was remodeled and still stands today as the Park’s Administration Building. Ironically, it was the vast prosperity of the city’s business and industrial sector that made all this possible. Even today, much of the success in building and maintaining North Park is being copied by other community organizations in Pennsylvania and around the world. Fortunately, the land around North Park is some of the most valuable property in Allegheny County today. Unfortunately, it is being overdeveloped and stripped of its natural beauty with no end in sight. This is not unlike what happened to the City of Pittsburgh in the 19th Century. • Newborns in early 19th Century America had less than a 20% chance of reaching age 10. • Human conception can only occur within a few hours of each month of a few years between a healthy man and a healthy woman. • You are who you are because of the 1 in 450 million chance of a single sperm fertilizing a particular egg. • Of millions of possibilities, you received 23 chromosomes each from your mother and your father. • With our understanding of what is called chromosomal “crossing over,” 8 million additional possibilities emerge. If just one chromosome had switched one part with another, you would not exist. That’s something to think about. Just as I pray often for my single adult children, I also pray for their future spouses, whoever and wherever they are. Without being prideful, we might thank God for our ancestors and the choices they made. As poet Robert Frost reminds us in “The Road not Taken,” they’ve made all the difference.